DERRY GAA: One goal to change a season . 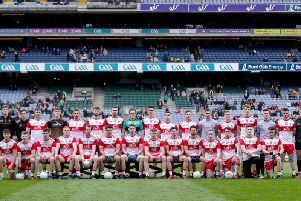 . .
Sunday was the type of win that can kick-start a season so it was ironic that a Tyrone man played a pivotal role. Referee Sean Hurson deserves credit. Derry’s league season was probably 60 seconds from heading into the ‘emergency room’ when Ryan Bell sent that high ball in toward the Kildare posts. Emmett McGuckin was faultless. He won the ball as a full-forward should but how many times does the referee take the easy option when the goalkeeper is challenged? Hurson initially signalled a free-out because that’s what the modern instinct dictates. Frees rule. So credit to the Tyrone official for being brave (and humble) enough to consult and listen to the closest man to the incident, his umpire, and reverse his decision. He was correct to do so. McGuckin’s momentum may have carried him into the keeper but it was only after he won the ball and there was no way of avoiding a collision. Had it happened between two midfielders, no one would have looked twice. Debate aside, this victory could be worth more than two points to Derry. The manner of the win was the type to restore confidence and rid players of nagging doubts. It was far from perfect but it answered critics who have been very reluctant to hand out any praise over the past 18 months. The impact of McGuckin’s goal is massive. Derry were facing a potential relegation shoot-out with Down before the Magherafelt’s man intervention. Suddenly Damian Barton’s team are eying the top spots in a Division in which only three points separate first from last. That’s how tight things are. In many ways the controversy of the late goal over shadowed Derry’s display which didn’t get the credit it deserves. This was a Kildare team with two wins from two and scoring for fun prior to Sunday. The opening half showed exactly why Cian O’Neill’s team have been receiving the plaudits they have. The movement of the front men was frightening at times and pulled Derry all over the place at times. Derry’s defensive system wasn’t great during that period. Despite having every player back, some looked unsure of their role and ended up marking redundant space while Kildare picked paths through an over-crowded home ‘45. But credit also to the likes of Neil Flynn and Niall Kelly. Any side would have strolled against the movement the Lilywhites forwards produced and Derry did well to go in only five points behind. The second half was a different game and what can you say about the performance of James Kielt. The Kilrea man sometimes divides opinion among Oak Leaf supporters but only because this is the type of display he is capable of. If he doesn’t hit these heights every week, questions get asked because of his ability but coming after his superb late leveller against Clare, there are signs Kielt is revelling in his midfield role and becoming a leader in this team. It is difficult to imagine any player in Ireland giving a better display of long distance shooting this season. McGuckin was the match winner on Sunday but Kielt was the catalyst for the win. Carlus McWilliams pushed Kielt hard for ‘Man of the Match’. What were encouraging early season displays in the McKenna Cup now look to be giving way to an assured county sweeper with a useful knack of getting forward for point as his three from play on Sunday testify. Conor McLarnon did what was asked of him in the No. 1 shirt. His early save from Neil Flynn settled any nerves and laid the foundations for an excellent performance. All this without Mark Lynch or any of the considerable Slaughtneil contingent who will be pushing for starting places. Down and Derry changed the Division Two narrative last weekend and the results sets up a pivotal clash in Owenbeg next Sunday. One result does not make a season but one goal may have a huge impact on it, thanks to a Tyrone referee.